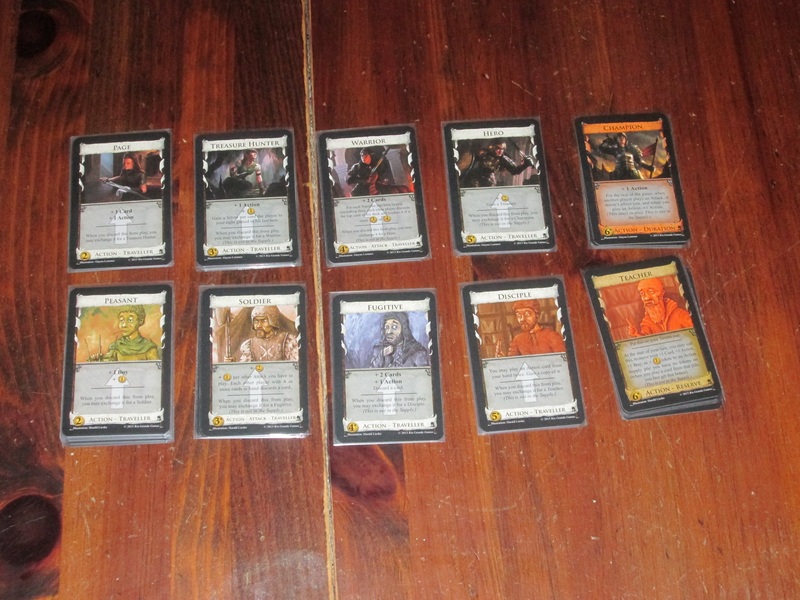 When Dominion: Guilds was released, there was great sadness among Dominion fans. Or gladness–depends on which camp you fell into. For me, it was a little of each. I was sad that the Dominion series had reached its end, but I was also glad that the game ended with nine great* expansions to its name before introducing catapults and other spurious game elements that would forever be mocked in expansion reviews (…). Then Adventures was announced, and there was much misgiving, despite Rio Grande Games and Donald X. reassuring us that any future “unplanned” expansions would have to add something genuinely new to the game and would not, in nonmarketing speak, be simply a money-grab. I was skeptical, aloof. I thought I could hold out and allow myself to withstand the sway of new baubles for my favorite game. 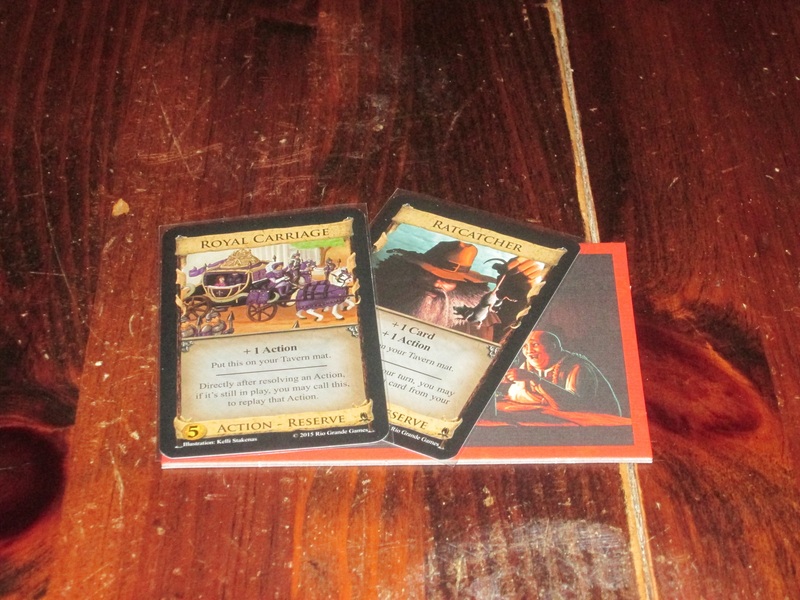 And then the card previews began, and I caved, and I bought Adventures soon after release. Now that I’ve had the expansion for nearly a year, what do I think about it? Each player has their own supply of tokens that can modify cards or that provide reminders (like drawing fewer cards or having less money to spend). Adventures also introduces a new card type: events. Events have a cost and can be purchased like cards, but instead of adding the event to your deck, you get a one-shot effect. Events remain on the table for the whole game, and anyone can access them. Finally, Adventures introduces “traveler” cards, which, when discarded from play, upgrade themselves into a better version of themselves and tell a miniature story. Nine Expansions and a Movie, or Jumping the Shark? Thankfully, Adventures delivers as an expansion, and in a major way. 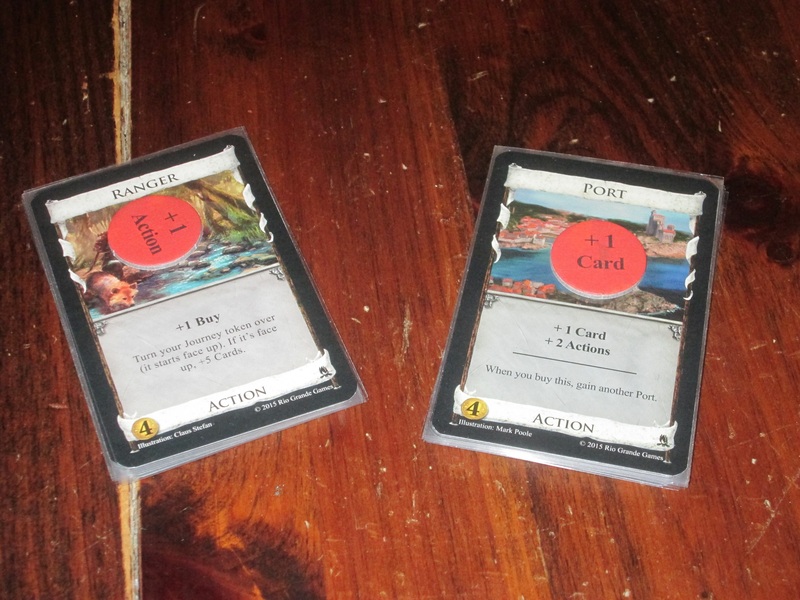 The best part of every Dominion expansion isn’t just the new cards: it’s the new ways to use your old cards. Just when you think, There are only so many ways to use a village, in ambles a new card that makes you rethink your prior uses. And in this respect, Adventures probably offers the most of any expansion to date. The main reason for this is the tokens. 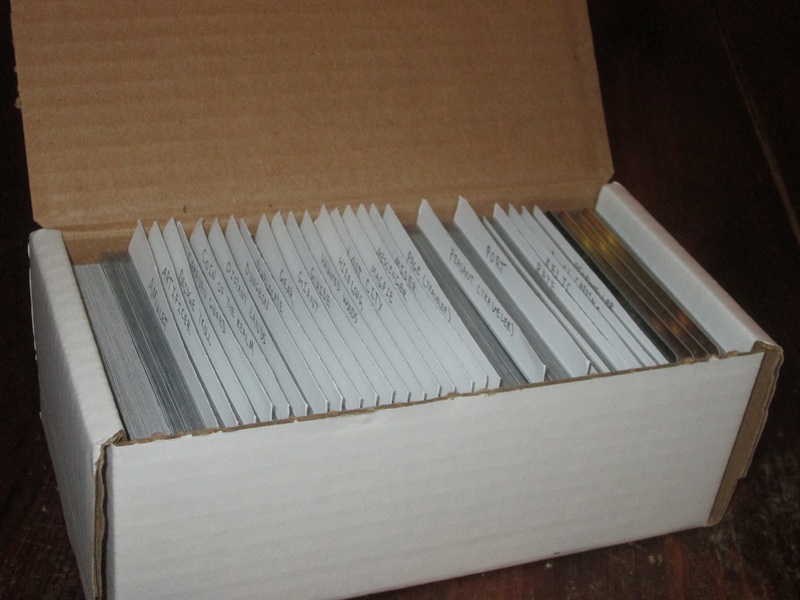 Tokens, mainly, allow you to modify cards in the general supply in ways that apply only to you. For example, you might add a +1 card token to that village, meaning that every time you play a village, you get the benefit of drawing an additional card. Or you might add a +1 action token to that terminal action that’s not quite good enough to add to your deck without it but that is indispensable with it. (Finally! A whole armada of Pirate Ships can play themselves in one turn.) Or you can turn your estates into pieces of your engine, making your Barons happy (and viable). The options are new each game, and even “vanilla” cards like those in the base set of Dominion are given new life with tokens. 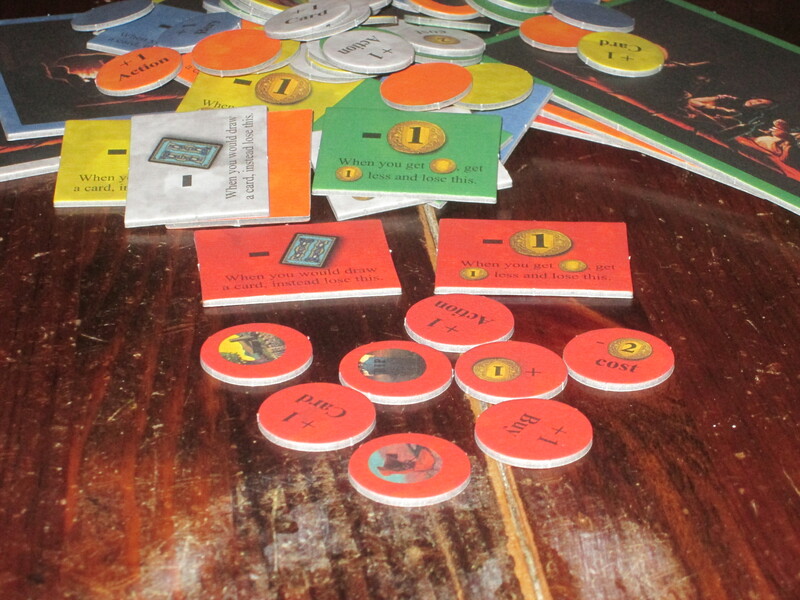 Some supply piles modified by tokens. Yes, those are great cards for red now. 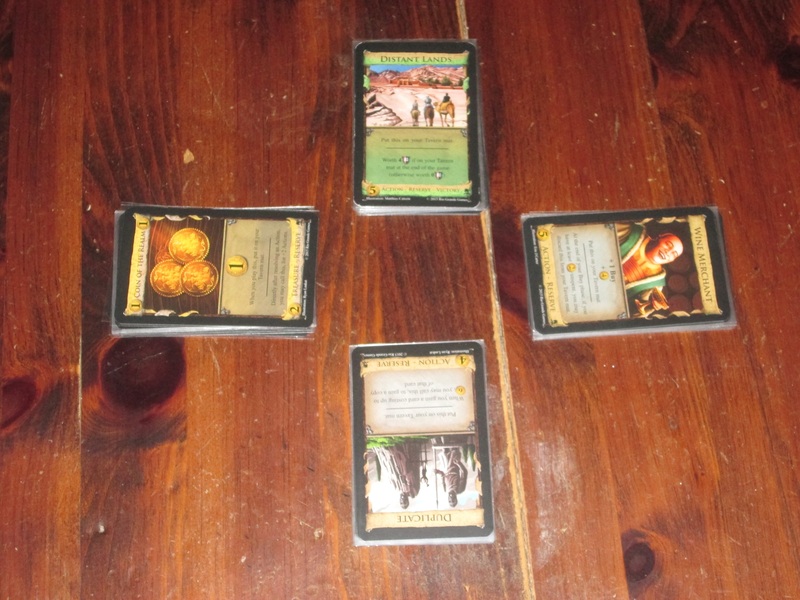 In one game, I used the Lost Arts event to place a +1 action token on the Ranger pile. Ranger is a good action by itself–it grants +1 buy and +5 cards every other time you play it–but it’s hard to chain together without a village. With the +1 action, I built a deck full of Rangers that allowed me to draw my entire deck each turn and then spend the money I drew with the extra buys. This combo is by no means special, but it illustrates the many new possibilities when tokens are in the game. A new card type (reserve) allows cards to be placed on your tavern mat until called. This is a great way to control when cards are played. Event cards can change the flow of an entire game. These new duration cards use the duration concept in fresh ways. Dominion also revisits duration cards (originally from Seaside) in Adventures, although here as well the game changes our expectations somewhat. Whereas in previous sets duration cards stayed in effect from one turn to the next, here they stay in effect until the card says to discard it. In the case of Hireling, you never discard it; your hand size is permanently increased by 1. Adventures also explores new territory in offering duration attacks, nasty cards that penalize your opponents for purchasing cards until your next turn. These new ways to use the cards are familiar–that is, the rules governing their behavior aren’t hard to pick up–but they are fresh enough to offer new decision space within the game. Traveler cards “level up” after use. Another space for new decisions is the traveler cards, which can “level up” as you play. When a traveler is discarded from play, you can exchange it for the next traveler up. The traveler cards tell a miniature story–a lowly treasure hunter who, through training, becomes a hero and a soldier who is put on the path of peace and eventually becomes a guru. These cards are fun, and they add flavor to the game, but they aren’t as interesting to me as the other cards the set has to offer, even though they seem the most interesting on paper. Still, I don’t refuse to play with them, and it’s fun to try to work their considerations (it takes several turns for them to be up to speed) into a winning strategy. Because the final cards in the traveler chains are amazing, players have to weigh whether it is worth it (or whether the game will last long enough) to pursue these chains. More reserve cards. It is occasionally difficult to remember to move these where you need them to be. If there’s anything negative to be said about Adventures, it’s that it is an expansion very much designed for experienced players. If you’re just starting out in Dominion, Adventures might not be for you. 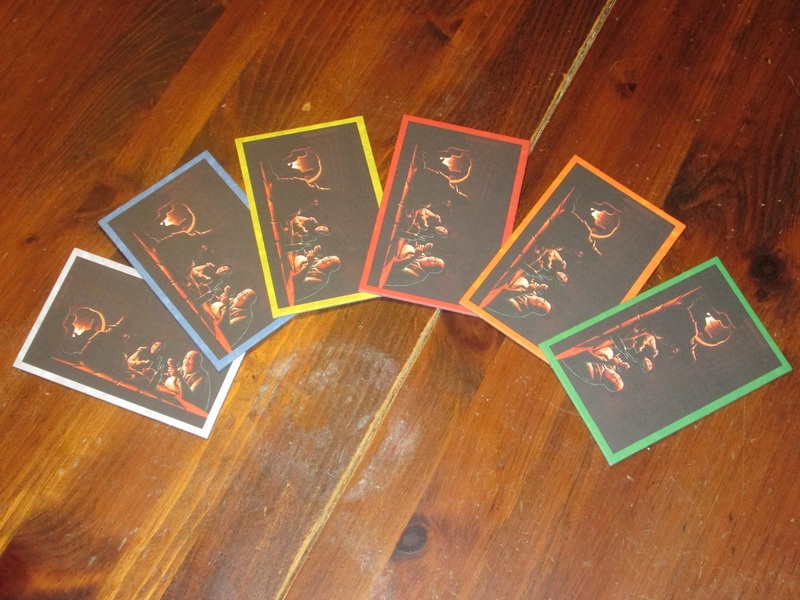 The cards are complex, and the decisions aren’t straightforward. 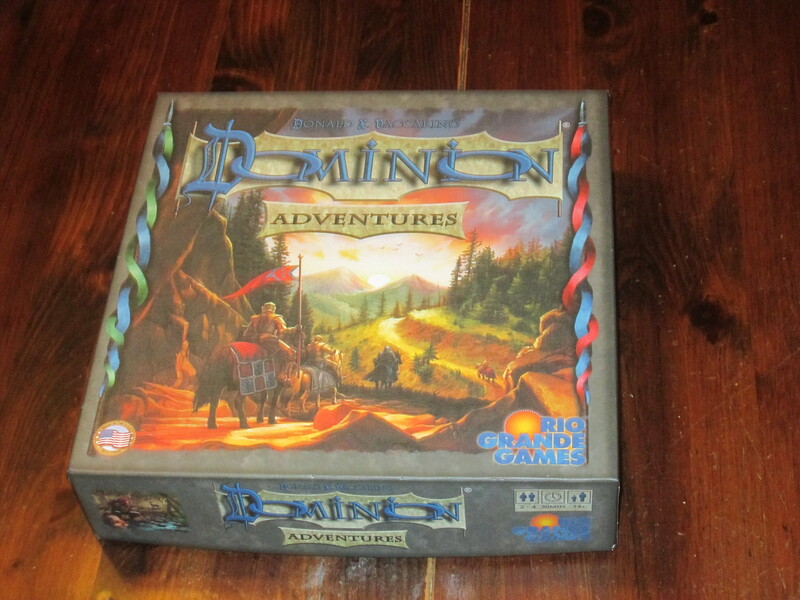 Adventures is, however, a wonderful capstone to the Dominion franchise as it really does revitalize each of the other expansions. I have my Dominion cards separated by expansions (rather than one big storage box), and I’ve taken to bringing Adventures and one other set to lunch and mixing the cards together. When you do this, you see the amazing combinations that open up in the game. You’re more likely to appreciate these combinations (in my opinion) if you’ve played the heck out of the other expansion before getting Adventures. So again, if you’re starting out, look forward to Adventures, but try the other expansions first. Adventures introduces some nasty attack cards, including Giant, which only fires on every other use. In addition to being a more advanced set in concept, Adventures is more of a gamer set because of its fiddly nature. Tokens go here and there. Is your Journey token supposed to be face up or face down? Did you remember to move that card to your tavern mat or to exchange your travelers? Frankly, it’s a lot to take in even for someone who is experienced with Dominion, but I put up with it because Adventures is awesome. It is not, however, something I would expect my family to put up with, so they’ll stick to the simpler sets for now. 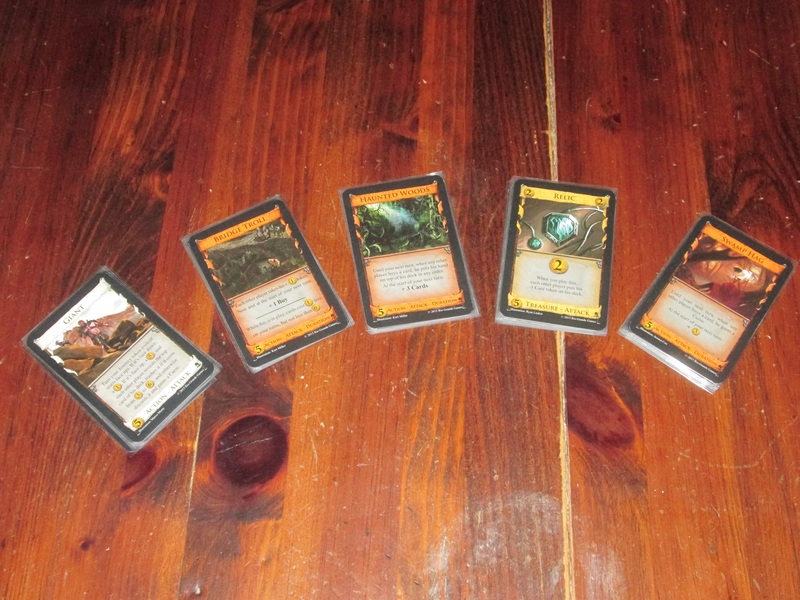 Because of its fiddly nature and the enormous amount of opportunity opened by concepts like tokens (as well as the increased text on the cards), games involving Adventures cards tend to take longer. I’m okay with this as Adventures is so interesting to explore, but again, it may not be for players who don’t already know they like Dominion. The tavern mats are printed so darkly that there might as well not be art on them. But hey, they work! A word on the components. There are many threads on Board Game Geek (example here) bemoaning the drop in quality in Adventures, which is the first of the Dominion expansions to be printed in the USA exclusively. And the truth is…there is a noticeable drop in quality. 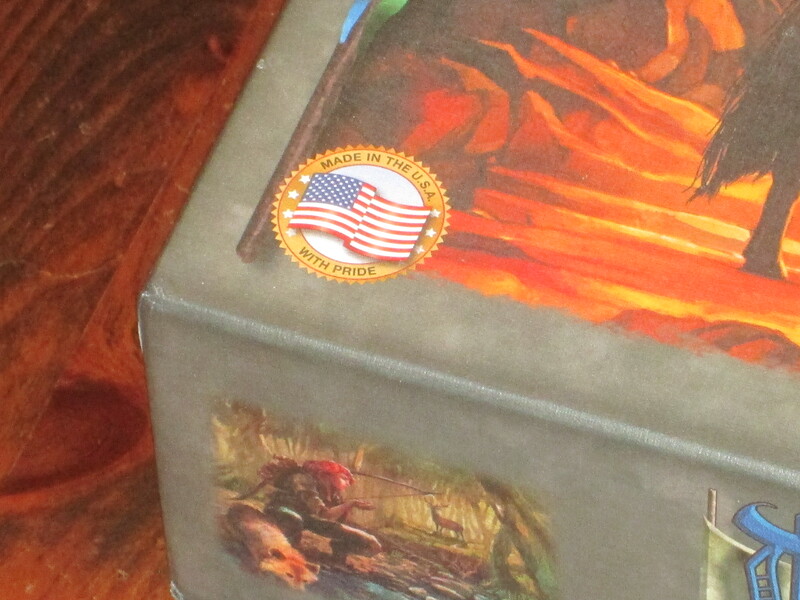 My box cover is a little off-center, my tokens are very much off-center, and the printing on the tokens and especially the tavern mat is quite dark. The physical materials are fine–it’s the same thick matte tile material used in Roll for the Galaxy–but it is poorly implemented here. The cards are bendier (apparently because the cardstock was rotated at the printer and the grain runs a different way), and without sleeves, I can tell with 100% accuracy whether a card is from Adventures or from an earlier printing of the game. I don’t intend to say that the component concerns are bogus. There definitely is a difference in quality. But for me, the differences are not grave enough to put me off recommending this expansion, especially if you sleeve your cards. If you sleeve your cards (or don’t riffle shuffle), the different cardstock shouldn’t make much or any difference in gameplay. 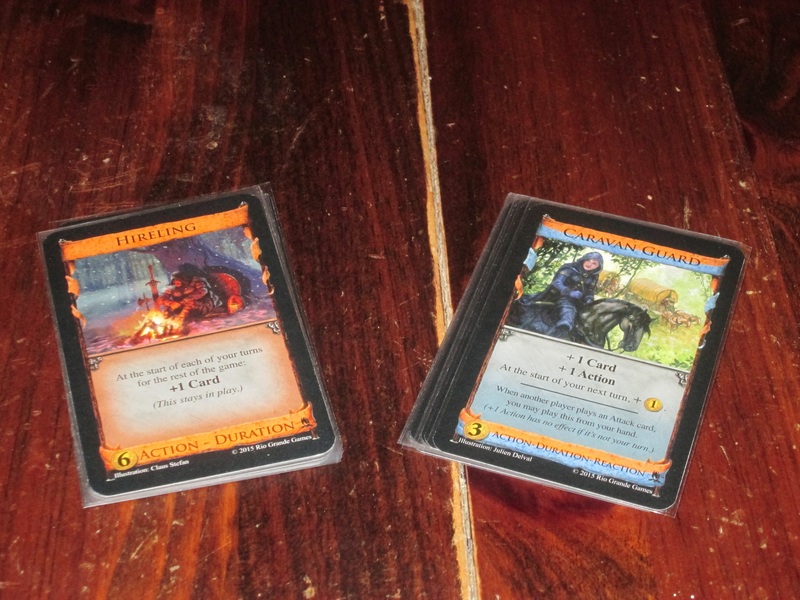 While the tokens don’t look great and the tavern mats are too dark to see much detail, they function just fine. And as much as I would love a perfect set, I’m content to have a set I can play with, and the cards that come with Adventures, as well as the concepts they represent, are just too good to hold off for a later printing. Despite the component complaints, I don’t regret being an early adopter of the Adventures expansion, and the differences are not great enough that I would consider rebuying it if a future printing fixed the issues I’ve raised. Is this what’s responsible for the lapse in quality? Perhaps, but for better or worse, this seems to be the norm moving forward. 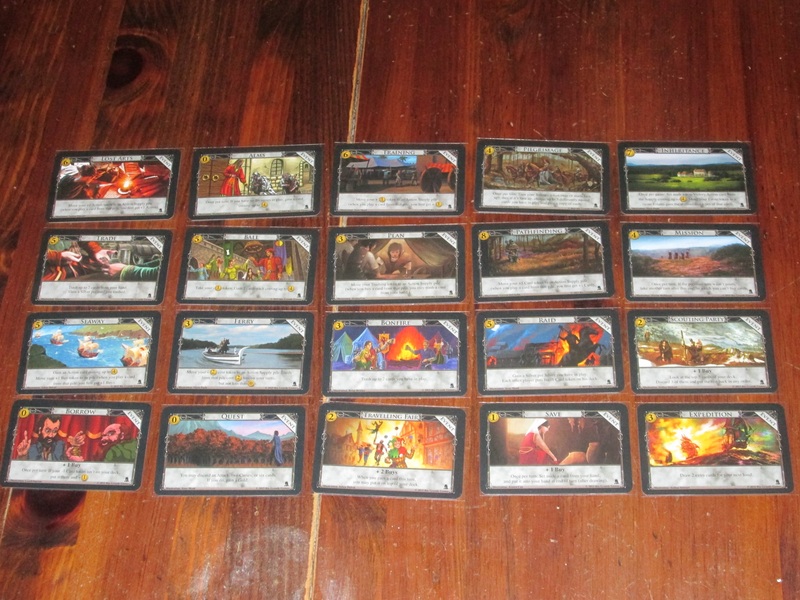 I think Adventures ranks with the best of the Dominion expansions, namely Prosperity and Intrigue. It’s perhaps not as essential as either of them, but what it lacks in necessity it makes up for in creativity and cleverness. As with most of the other expansions, I prefer to mix Adventures with other sets rather than use its cards exclusively. Adventures is definitely the most advanced set to date, but it’s worth the complexity and fiddliness for what it offers in fresh gameplay. Every new Dominion set makes you see the others in a new light, but Adventures does this even more. With it, the possibilities are, almost literally, limitless. I look forward to every play with this set, and I can’t wait to see what crazy combos my friends and I discover with further play. My storage solution for Adventures. Grab this and another box, and I’m ready to play on my lunch hour. * Even Alchemy and Cornucopia, expansions that I don’t love, aren’t bad, and I won’t refuse to play with them.